Dr. James Dobson, founder of Focus on the Family, founder and president of Family Talk, a ministry that promotes principles that support marriage, family, and child development and the radio program "Family Talk with Dr. James Dobson" has endorsed Donald Trump for President. Here is the full text of Dr. James Dobson’s personal endorsement of Donald Trump for President. “I have decided to endorse Donald J. Trump for President of the United States, not only because of my great concern about Hillary Clinton. I am supporting Mr. Trump primarily because I believe he is the most capable candidate to lead the United States of America in this complicated hour. I am also very enthusiastic by the selection of Gov. Mike Pence as Mr. Trump’s running mate. Together, I believe they will make America great again. “Mr. Trump has been unwavering in his commitment to issues that are important to evangelicals such as myself. In particular, I have been heartened by his pledge to appoint conservative Supreme Court justices, preserve religious liberty, rebuild the military, and defend the sanctity of human life. On the issue of abortion, I choose not to evaluate him based on his past position but rather on what he says are his current convictions. I believe God can change the hearts and minds of people and I celebrate when they support principles of righteousness. “Without a doubt, my decision to endorse Mr. Trump has been influenced by the way his children speak of him as a father. As a psychologist and a family counselor, I have spent my life equipping and resourcing families. One thing I have observed is that you cannot make a “child talk about his or her parents the way Donald Trump¹s children speak of him. That is one of a man¹s most significant affirmations. 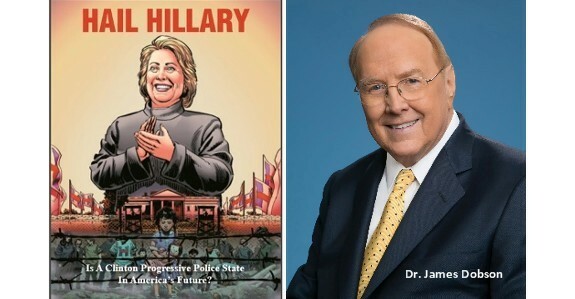 Dr. Dobson also recently shared with Christianity Today why he is voting for Donald Trump and his concerns about a Hillary Clinton presidency, with his permission we excerpt his article here. What are the strongest arguments for a Christian to support Donald Trump for the US presidency? First, let me say that I will respond to your questions as a private individual and not as a representative of the organization I lead. I don’t vote for candidates or political parties. I support those who will lead the country righteously, honorably, and wisely. In many ways, this is a single-issue election because it will affect every dimension of American life: the makeup of the Supreme Court. Antonin Scalia’s sudden death made this election the most significant of our lifetime. The next president will nominate perhaps three or more justices whose judicial philosophy will shape our country for generations to come. Unelected, unaccountable, and imperialistic justices have a history of imposing horrendous decisions on the nation. One decision that still plagues us is Roe v. Wade, imposed on America in 1973. It divided the nation and has led to the murders of 54 million innocent babies. This killing goes on every day. That leads us to ask what the judiciary will look like in a Trump administration. I attended a June 2016 event called “A Conversation with Donald Trump” in New York, with more than 1,000 other religious leaders. Before the meeting, 30 of us met Trump in a private session in Trump Tower. Most were evangelicals or conservative Catholics. I asked the candidate about his concerns regarding religious liberty. Trump’s selection of Governor Mike Pence as his running mate was a hugely encouraging decision. I’ve been a personal friend of Gov. Pence for more than 30 years. He is pro-life, pro–traditional marriage, a godly family man, a solid conservative, and a competent leader. There is no politician whom I respect more. Many supporters of Trump believe that Clinton would be a disaster for the country. What are your concerns about Clinton? “Reproductive health care” is a euphemism for abortion, so that threat should send chills down the backs of every true believer in Jesus. It blatantly contradicts guarantees of the US Constitution. We dare not give ultimate power to anyone who does not respect or feel limited by this historic document. It is the basis for all the freedoms handed to us by the founding fathers. I’m convinced that with the wrong president, we will soon see a massive assault on religious liberty. Certain powerful groups and organizations seek to weaken the church of Jesus Christ and limit what pastors and ministers can say and do publicly. They believe some of our teachings represent “hate speech” and must be stifled. They seek to severely restrict the freedoms of Christian schools, nonprofit organizations, businesses, hospitals, charities, and seminaries. With Christian colleges and universities, they want to limit whom their leaders choose as professors and what their students will be taught. Government funding and accreditation will be in the crosshairs, and you can be sure that home schools will be targeted. We at Family Talk have experienced this tyranny firsthand. The Department of Health and Human Services has mandated that Family Talk and many other Christian nonprofits cover contraceptives known as abortifacients in their healthcare plans. They include the morning-after pill and other medications that are known to prevent embryos from implanting in the uterus. They can be baby killers, and we consider them immoral. The Feds have forced us to sue to find relief. We are now in a federal lawsuit that may be decided by the Supreme Court. If we lose our case and refuse to comply, we’ll face ruinous fines and will be forced to close our doors. It all will depend on five attorneys who sit on the Court. There are many other concerns about Clinton’s candidacy. She has proposed to pay for abortions in countries around the world, including generous funding for Planned Parenthood; and she is committed to the most radical demands of the LGBTQ agenda, to name but two. Submitted by email_registrat... on Mon, 10/03/2016 - 11:20.